With the help of its modern equipment, the laboratory of the Museo d’Arte e Scienza is able to perform analyses using infrared reflectography, Wood’s light, a stereoscopic microscope, IR spectroscopy and other instrumental techniques. Wood’s light and monochromatic lights permit an evaluation of the extent to which a painting has been restored, touched up and overpainted, as well as identification of various fluorescent substances. Infrared reflectography permits an in-depth examination of the painting, bringing to light underdrawings or grids, pentimenti, the depth of the craquelure and identification of restoration work or the use of different materials. 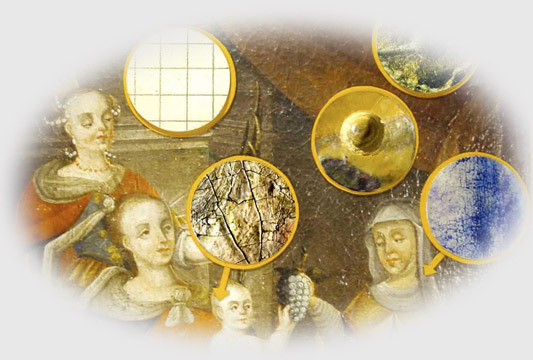 IR spectroscopic analysis and dating permit the examination of a number of materials in order to verify their compatibility with the supposed historical period: pigments, binders, glues and varnishes, as well as the painting’s stretcher and support. This proven series of scientific tests verifies the compatibility of the work with a precise historical period, thus making it possible, for example, to tell a 17th century painting from a 19th century copy or an even more recent reproduction. Only works presumed to have been painted before 1900 are analyzed.